It&apos;s been less than a month after the world premiere of the three-door Veloster at the Detroit Motor Show, and the Korean automaker is really on top of it with its big plans for the car. Hyundai released a teaser photo of a rally-prepped version of the Veloster, complete with Red Bull livery, and it will be unveiled at next week&apos;s 2011 Chicago Auto Show. Unfortunately, this teaser doesn&apos;t mean that there are extra details. 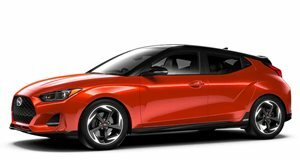 In any case, in the beginning of March, the South Korean automaker will also reveal the Euro-spec Veloster at the Geneva Motor Show. It&apos;s still unknown if we&apos;ll also see the range-topping version with a 1.6-liter turbocharged engine producing some 208-horses.